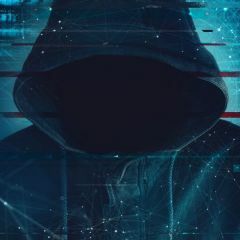 Turn on TLS 1.0, TLS 1.1, and TLS 1.2 in Advanced settings and try connecting to https://mybot.run again. If this error persists, it is possible that this site uses an unsupported protocol or cipher suite such as RC4 (link for the details), which is not considered secure. Please contact your site administrator. Make sure the web address https://mybot.run is correct. 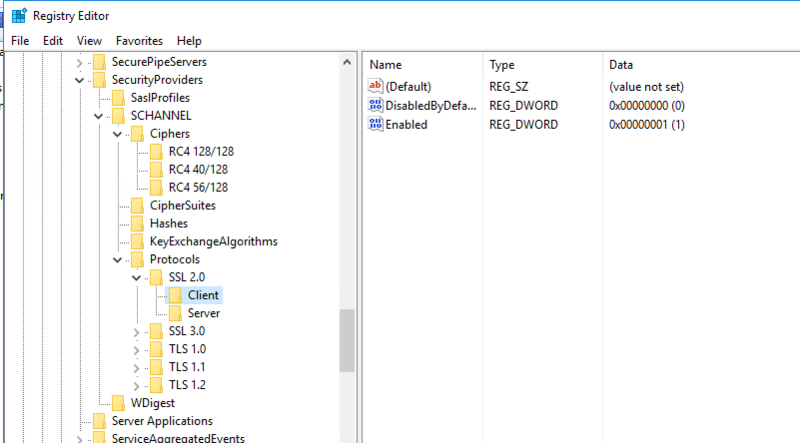 An SSL 3.0 connection request was received from a remote client application, but none of the cipher suites supported by the client application are supported by the server. The TLS connection request has failed. Tried loading https://mybot.run/forums/ in IE with various windows server 2016 machines. Running on hyper vm and on azure. And had same problem. All other sites with https works. 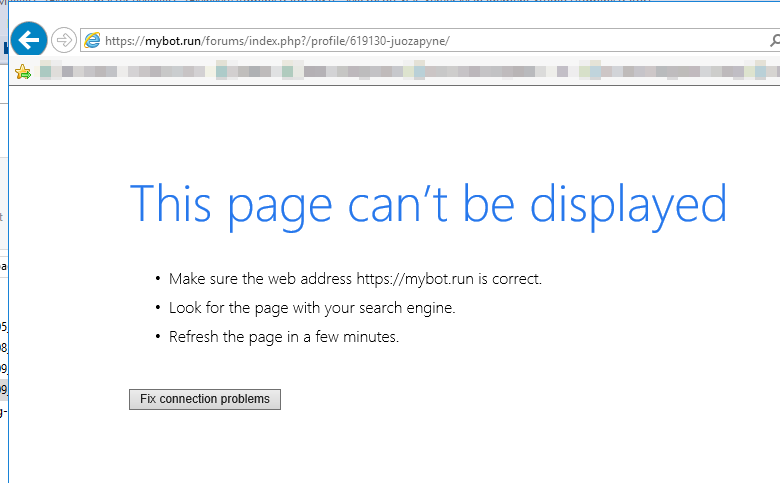 When you have issues reaching MyBot.run web site using an browser, you have a system issue; not a bot issue. This needs to be fixed before attempting to use bot! Have you tested connection to MBR site with Chrome or Firefox? BTW - QUESTION: Have you every loaded another bot on this PC? If you have ever used another CoC bot before using MBR on your PC; then you likely have an infected PC. The other bots that stole this work to make their Coc bot, hate that MBR is free, and want to make sure that you could never reach the MyBot.run websites. 1) One thing they have done is redirect/block the web addresses via HOSTS file. Edit your hosts file, remove any references to MBR. 2) They use hidden code in their DLL that add firewall rules for known protection software. Check you Microsoft, Norton, Mcafee, Panda, etc firewall software for any rules related to MyBot.run sites. 3) Recently, was rumored they started adding rules to browser configuration files as well. Have not witnessed this trick first hand, so can only suggest you install a different browser (after you remove the other bot), and try reaching MBR. This needs to﻿ be fixed before attempting to use bot! Have you tested connection to MBR site with Chrome or Firefox? 3) Recently, was rumored they started adding rules to browser configuration files as well. Have not witnessed this trick first hand, so can only suggest you install a different browser (after you remove t﻿he other bot), and try reaching MBR. I agree that this is system issue. But not this particular system, but windows server 2016 system compatibility related issue. I cannot access this https forum with IE, but it's only an assumption, that this is the cause. I included MBR logs for analysis. Sorry, don't have access to windows server 2016 to poke around for answers with MBR site HTTPS encryption errors? Most likely @KevinM as he set up the current forum server years ago. Might as well tell @cosote the new authentication code has a bug related to security protocols too.
" Forum login failed, message: Object reference not set to an instance of an object. " from bot log simply means bot cannot connect to forum as well. I see in the logs of the forum that last time bot was able to authenticate was on April 8th, did something change on your Windows install after than? I'm on Microsoft Windows NT 10.0.14393.0, yours is Microsoft Windows NT 10.0.17134.0, I'll check if I can update late mine and verify it's related (don't think so though). Anti-Virus scanner might interfere with https communication, might be related. I was able to reproduce some of your issues by resetting my IE security settings including zone settings... all TLS 1.0, TLS 1.1, TLS 1.2 including SSL 3.0 were enabled, but could not login with my username/password. The forum was displayed, but couldn't login and some images were missing. 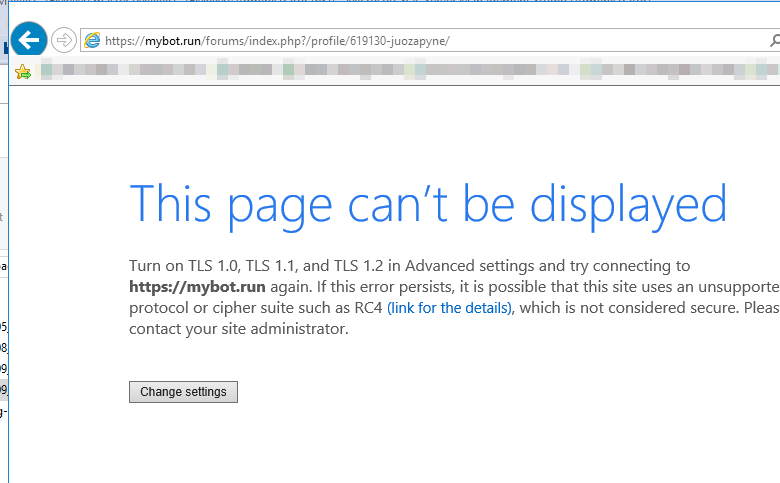 Only way I was able to get the forum run normal in IE again was to add https://mybot.run to trusted sites and all was fine again. I see in t﻿he logs of the forum that last time bot was able to authenticate was on April 8th, did something change on your Windows install after than? I'm on Microsoft Windows NT 10.0.14393.0, yours is Microsoft Windows NT 10.0.17134.0﻿﻿, I'll check if I can update late mine and verify it's related (don't think so though). April 8 it was mybot login from my local windows 10 machine for generating .mybot.run.authentication file and trying it on windows server 2016. My exact windows 2016 server build is 14393.rs1_release.170602-2252. But I tried it also on few brand new azure hosted windows server 2016 environments. There something with https certs.. But I am not sure what's exactly. I still cannot solve showing https://mybot.run/ on ie. Even after adding this domain to trusted sites. I cannot use any emulators on my local windows 10 as it has hyper-v component enabled.